The Sankara Eye Foundation and Asvathaa Pte. Ltd announced a unique initiative today for charitable giving through Social Gaming. Players of “Karma Kingdom”, Asvathaa’s Facebook game, will be able to purchase uniquely branded game element with half of the proceeds going to restore vision to the poor and the socially disadvantaged in India through Sankara Eye Foundation – USA, a first for a charitable organization. 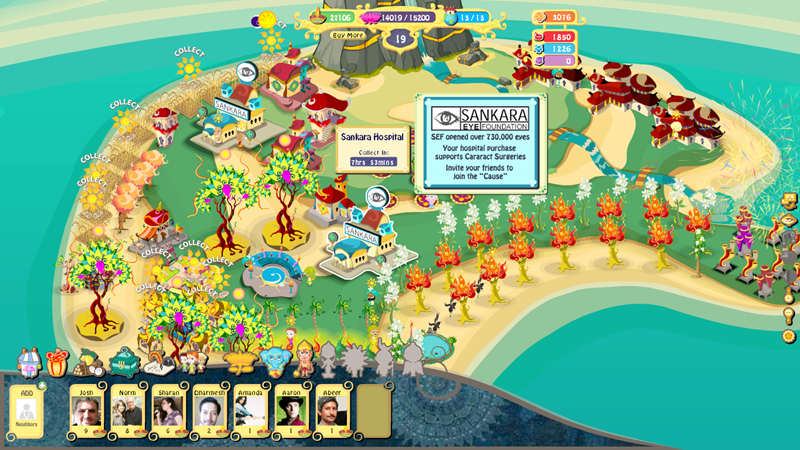 The Facebook game is based on Indian mythologies and guides players through positive contemporary lessons. Sankara’s mission is to realize the goal of 20/20 vision for the people of India by the year 2020. Sankara Eye Foundation (SEF) initiates and drives community eye care activities in India by working with Sankara Eye Care Institutions, which run the Sankara Eye Hospital in Coimbatore and 7 other locations in India. The Sankara Eye Foundation, USA is a 501 (c) (3) registered non-profit organization, with offices in Milpitas, CA. The majority of fundraising is achieved through fundraising events, booths in major events, advertising and working with major donors. One of SEF’s unique initiatives is enabling a vision restoration cataract surgery for $30. Through these efforts, SEF, USA has played a significant role in increasing the number of free surgeries in India thirteen fold to over 120,000 in 2010-11 and increasing the number of Indian hospitals from 1 to 8. SEF USA raises funds for constructing the hospitals with its unique “founding donor” program, through which a donor gets his loved ones names on the hospital wall of founders for a $1000 donation. Elaborating on this initiative, Asvathaa’s CEO Mr. Ashok Desai stated, “Karma Kingdom was designed from the outset to include these types of charitable elements and we want this to be the next step for players to fulfilling the goal of ‘Creating a Better World’ within the game. We were highly impressed with the great work done by Sankara Eye Foundation over the past 13 years and hence unanimously decided to partner with them.” Added Mr. Desai, “A single Karma Kingdom player can make a significant contribution towards a surgery, given the price break that SEF has achieved in Cataract Surgery”. Mr. Desai added, “This is a great step forward, and we hope the first of many partnerships with charitable organizations. We are uniquely positioned to help them leverage the power and reach of social gaming for the greater social good”. Karma Kingdom was released recently for Facebook users globally and is currently being played by users in more than a dozen countries around the world. Asvathaa is constantly updating and finding new ways to bring these Indian Mythologies and their positive lessons to life. Heya¡­my very first comment on your site. ,I have been reading your blog for a while and thought I would completely pop in and drop a friendly note.
. It is great stuff indeed. I also wanted to ask..is there a way to subscribe to your site via email?